A place is a stalwart host for eras as they come and go, engaging in a give-and-take relationship with the societies for which it serves as a setting. While societies adapt to the landscape as they eke out a living upon it, it in turn accumulates remnants of the transient lives that pass through. Before Jonas Bronck lent his name to a land situated upon three glacial ridges in which he saw “unlimited opportunities,” its native inhabitants lived symbiotically with its rich forests. Since then, industrious settlers have brought the Bronx landscape along with them as they have progressed, regressed, suffered, and thrived. Over the course of a century, the Bronx was transformed from a serene suburban haven to a densely populated, culturally vibrant urban borough; it has been carved up by highways, decimated by poverty, burnt down, and built up. It is in a constant state of flux, and each day people trod through it, leaving behind signs and traces of their existence, inadvertently participating in this grand performance of time. As a place of little pretence, the Bronx is an apt setting to study the visual signs of transient life. It wears evidence of the many ways in which its space has been utilized over time and carries tangible pieces of the life it bears. 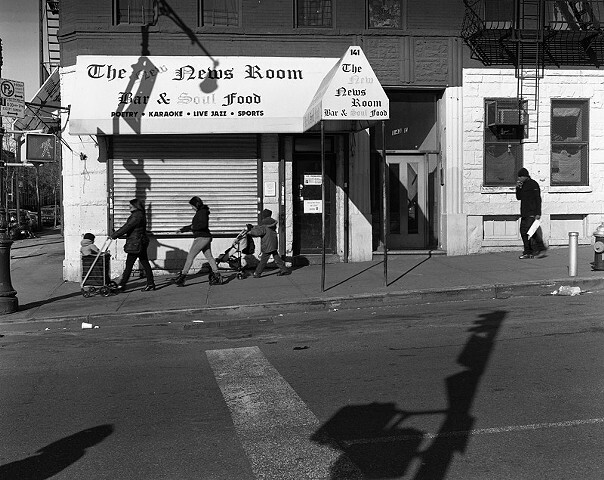 Using a 4x5 view camera, I capture the happenstance details that visually compose the Bronx, finding a quiet beauty among the bustle of a borough that barely stops to recognize itself.